Hi everyone!! I am so honored and thrilled to be apart of Lawn Fawn's Fawny Holiday Week! The Lawn Fawn and Lawnscaping DT's have teamed up and there are so many wonderful talented ladies, and I hope you've enjoyed all of the wonderful inspiration so far! OH! And...there are prizes - so be sure to leave comments for your chance to win! 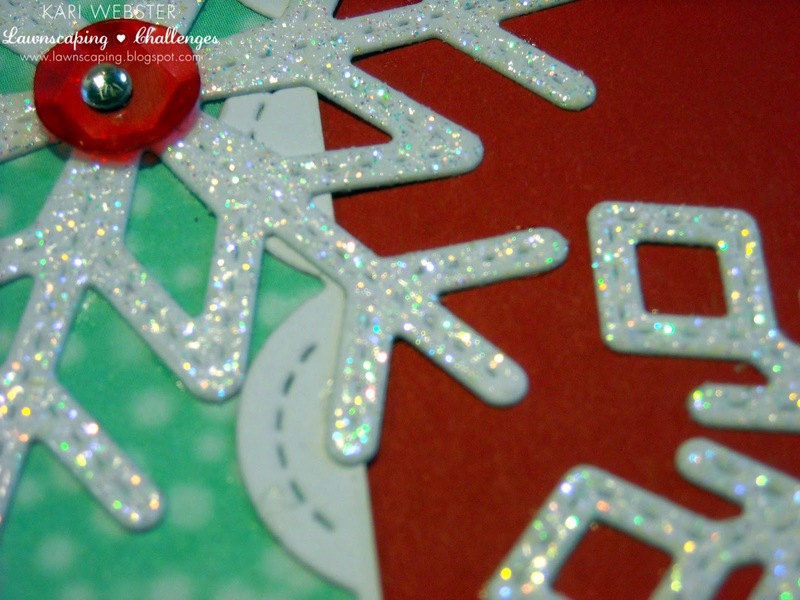 For my card, I wanted to use the Stitched Snowflakes dies. I die cut three of them and I wanted to add some shine and sparkle, so I applied my Versa Mark Ink pad directly onto the snowflakes, and then I added some Ultra Shimmer WOW Embossing Powder, and then I heat set them. They are so pretty in person!! I also used some scraps I had of the Snow Day 6x6 paper pad. I had used the red snowflake pattern on a previous project when I die cut it with the Large Stitched Rectangle Stackables - I used the largest die and had a strip of it left, so I used that as well the teal snow falling pattern, probably one of my favorites from the pack and I adhered both strips directly to my red card base. I wanted a pop of white other than the snow flakes, so I used the largest Stitched Scallop Border die and added that to the teal pattern paper to give it a finished edge. 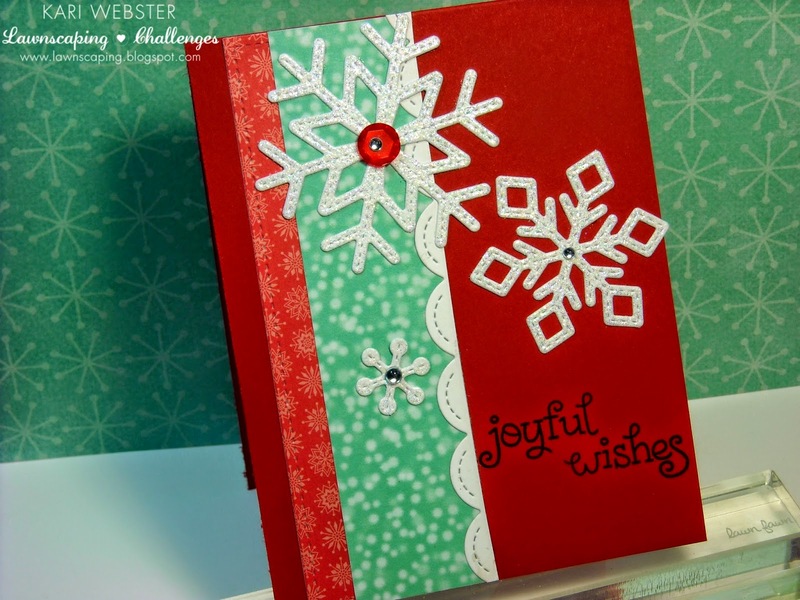 For my sentiment, I used the 'Joyful Wishes' from Joy to the Woods stamp set. I strategically inked it up in Versa Fine Onyx Black ink so it would the sentiment wouldn't be in one line. Then, it was time to adhere my snow flakes, and to finish them off I added some Hero Arts gems and I used a red sequin from my stash to the largest snow flake. I like how simple this card is, but elegant at the same time!! Thank you again to Lawn Fawn for the pure joy of being apart of this wonderful week!! Happy Fawny Holidays!! Kari, you have done it again! Love how you put everything together. I get in such a rut that I don't think to pull out the scalloped border. Your snowflakes are so pretty! I need some of that embossing powder. Thanks so much for all of your inspiration! Love your posts and your videos! Simple and Beautiful. I love it! !